Fresh dill adds a vibrant, clean taste to various dishes and cuts of meat. Dill is slightly sweet and bitter and pairs well with egg and potato salad dishes. The word dill is from the Norse word “dilla” which means “to lull” because it’s known to assist in digestive issues. Orange dots show how 1 cup of dill fits into the typical nutrient profile of a Paleo meal. FRESH: Fresh dill is fragrant, wispy and bright green in color. 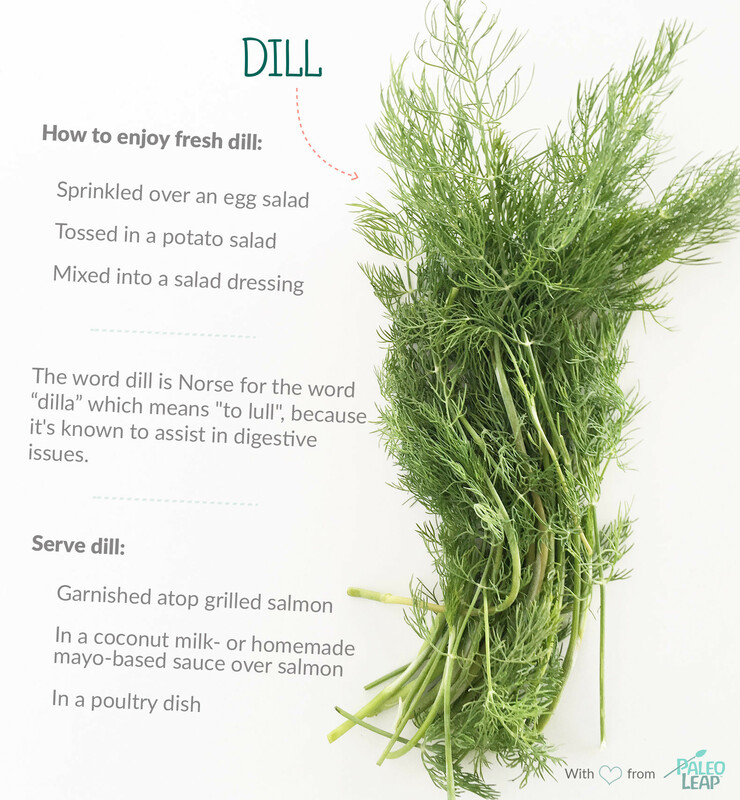 Fresh dill will only keep for a few days in the refrigerator, so use it quickly! DRIED: Dried dill is not quite as flavorful as fresh dill, but will keep in an airtight container for many months. STORAGE: Having trouble using all your fresh dill? Freeze-dried dill retains much of it’s flavor, and can be used months later. Combine dill with coconut yogurt or homemade mayo to create a sauce to serve alongside fish or chicken. Dill pairs well with fish; garnish atop salmon. Pinch a bit of fresh dill into your scrambled eggs or your favorite egg salad recipe. Dill adds freshness to dishes; use fresh dill in a creamy potato salad.